This love doesn’t come natural! I am so glad that Jesus loves me. His love has transformed me and will continue to do so till either I go to be with Him or He returns. This is a promise from Him for everyone of us that are followers of Christ. 2 Corinthians 3:16-18 NIV 16 But whenever anyone turns to the Lord, the veil is taken away. 17 Now the Lord is the Spirit, and where the Spirit of the Lord is, there is freedom. 18 And we all, who with unveiled faces contemplate the Lord’s glory, are being transformed into his image with ever-increasing glory, which comes from the Lord, who is the Spirit. It is truly awesome to know that He will never give up on us. He will continue to change us more and more into His image. One of the ways I have found Christ changing my heart is in my attitude towards others. Through the Word of God and His Spirit moving in my life, I am discovering that many of the things I used to feel and believe are no longer applicable. He truly does transform us and sometimes we don’t even realize when it is happening until we find ourselves seeing a situation from a different perspective than we ever did before. There were times in the past where I would take a haughty attitude towards others and their messed up lives. Christ is melting my arrogance and hardness towards others. It is a slow procedure but it is definitely happening. My prayer these days is that God would break my heart with what breaks His heart! It is too easy to get settled into an attitude of judgment and arrogance towards others. I am not suggesting turning a blind eye to sin but I am suggesting that the only one worthy of judging another’s heart is Christ. People that don’t know Him as Lord and Savior are not lead by His Spirit and until they are they will not behave in ways that bring glory to His name. They need Jesus and we need to tell them. What they don’t need is us pouring condemnation on them in anger or bitterness. God’s Spirit is more than capable of wooing them to Jesus. It is through sharing the good news, prayer and demonstrating the love of Christ that people will be won. Treating them like lepers or with bitterness will never draw anyone to the lover of their soul. 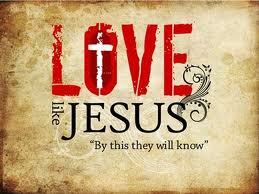 Our focus should be on doing what comes the least natural to us and that is loving like Jesus does! I want to share several scriptures today to encourage you to live a life that glorifies Christ. Though these are only a few verses, they are powerful ones and when we take the time to meditate on them and ask Christ to help us to walk them out they will bring about the kind of change in us our fellow believers and the world needs to see. James 2:12 NIV 12 Speak and act as those who are going to be judged by the law that gives freedom, 13 because judgment without mercy will be shown to anyone who has not been merciful. Mercy triumphs over judgment. This is an incredibly powerful verse for us all to remember! Matthew 18:21-22 NIV 21 Then Peter came to Jesus and asked, “Lord, how many times shall I forgive my brother or sister who sins against me? Up to seven times?”22 Jesus answered, “I tell you, not seven times, but seventy-seven times. This is certainly not a popular teaching today! “Go and do likewise!” Jesus used this parable to demonstrate to a man determined to live by the letter of the law that he was to show mercy, just as we are! Romans 12:17-21 NIV 17 Do not repay anyone evil for evil. Be careful to do what is right in the eyes of everyone. 18 If it is possible, as far as it depends on you, live at peace with everyone. 19 Do not take revenge, my dear friends, but leave room for God’s wrath, for it is written: “It is mine to avenge; I will repay,” says the Lord. 20 On the contrary: “If your enemy is hungry, feed him; if he is thirsty, give him something to drink. In doing this, you will heap burning coals on his head.” 21 Do not be overcome by evil, but overcome evil with good. And finally I will finish with 1John 3:15-16 NIV 15 Anyone who hates a brother or sister is a murderer, and you know that no murderer has eternal life residing in him.16 This is how we know what love is: Jesus Christ laid down his life for us. And we ought to lay down our lives for our brothers and sisters. 17 If anyone has material possessions and sees a brother or sister in need but has no pity on them, how can the love of God be in that person? 18 Dear children,let us not love with words or speech but with actions and in truth. When we find ourselves looking down on others in judgment, we need to examine ourselves and ask Christ to bring about the change that will result in our living as He lived, loving as He loves and allowing us to each be a light in this dark world of ours. It is the fact that Christ died for us while we were sinners that demonstrated His amazing love! We didn’t have to clean ourselves up first. He took us just as we were. Thankfully He doesn’t leave us as we were but continues to change us from glory to glory! Just as He longs to do for all those who have yet to know Him as Lord. For those of our brothers and sisters in Christ, be an example and a source of encouragement. Love them as Jesus loves them. Rebuke when necessary but don’t allow any bitterness to spring up in your heart towards them. We fail in our walk with Christ when our love is limited to those who we deem worthy. We are to love those, who at times appear very unlovable! Ours is a higher calling. Let your life demonstrate the love of Christ to others. By doing so, we are demonstrating our love to Him. ← Vengeance is not OURS, despite how we may feel. This demonstration of love is what God has been calling me to lately; taking concrete steps made from faith and trust in Him, instead of fear. Thank you for reminding us of this, which is the very meat of the lived-Gospel. In this world that calls out to enrich and worship the god of self, we need persistent exhorting in this direction. I appreciate your blog.